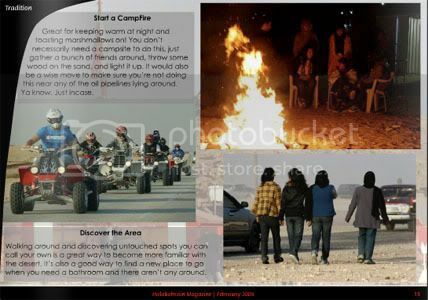 - Desert Camping: Yes, it's the heart of the camping season! As people put up tents and start sleeping out in Sakheer, there's quite a lot going on; we cover the things to get up to while out there! 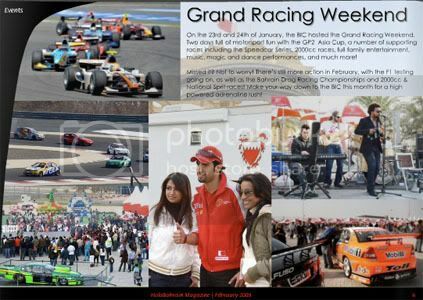 - Grand Racing Weekend: A full festival of music, fun, games, and high speed powered racing! The BIC got busy for the GP2 Asia Cup, as well as a host of other supporting races! 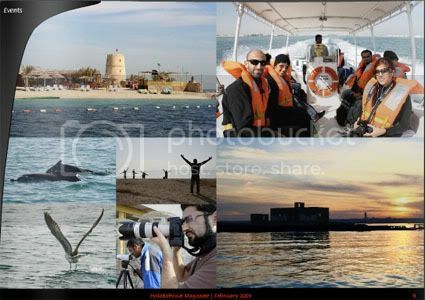 - Elham Events: Elham Group was pretty busy this month, with an event at AlBareh showcasing a number of talents, as well as a full trip out to AlDar Islands to capture everything from imagery and video of dolphins, birds, wildlife, and more! - Also in this issue: 360 Degrees of Comedy with tons of laughs, new Bahraini taxi's, delicious Indian food at Lanterns Restaurant, and interview with talented Paparazzi owner and Photographer, Aziza Salman!